Image Size: 29"w x 25"h.
The long arc of the Cheyenne People began with them in permanent settlements and farms, then nomadic hunters and gatherers as they migrated west and south, then expert horsemen and buffalo hunters, and finally, as fierce warriors against other tribes for territory and the white men for mineral rich land. Cheyenne fought in the Battle of Little Bighorn in 1876, a victory for the Native Americans, but a turning point in the U.S. government’s determination to force them onto reservations. 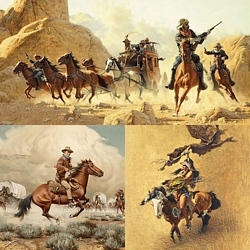 In "Cheyenne War Party," artist Frank McCarthy dramatically captures the intense resolve of these men on a mission.